2 Bedrooms, 1 Bathrooms, Renovated Canalfront Home close to the beach! This home is a newly renovated half duplex on a quiet cul-de-sac street, backed up to a spacious deep water canal. There's plenty of dock space that will accommodate up to a 24' boat. Two parking spots out front leave room to park a trailer and a car or 2 cars in the driveway. There's a large family table in the relaxing screened in porch overlooking your canal, landscaped side yard, spacious, open floor plan, washer and dryer, outside grill, and huge bedrooms with giant closets. There's wiifi, cable, brand new refrigerator and all new stainless steel appliances, and a fully stocked kitchen. One bedroom has a king bed, the other a queen, and there's one newly redone bathroom. The house is undamaged from the hurricane and we have been hosting guests since shortly after. This house is the perfect home away from home on your Florida Keys vacation! Hi! My name is M'Liss. I'm an experienced host who loves to travel. I'm managing this property for my mom. I'm more than happy to assist in any recommendations you may need to maximize your vacation. Please don't hesitate to contact me if you need anything or have any questions or issues. We bought this house because we think it is a gem. It's small enough to be manageable and affordable, but still has perfect canal access and a quiet, intimate neighborhood. We like that it can accommodate small families or couples really well, maybe people that aren't looking to stay or pay for a giant fancy 5 bedroom home. When we bought it we thought it was a perfect fit for us, and I think you'll find it to be a perfect fit for you as well. Great! It was nice to meet a manatee. So glad you guys got to see some of those sweet nuggets! I'm so glad you guys had a great time! Had all kitchen necessities and all was clean and comfortable. Thanks so much for your review and I'm so glad you guys loved the house! Thank you so much Christian! I love when we can help guests make memories with their family! You guys are welcome back any time! Great stay! Very clean, new appliances and furnishings. Wonderful. I'm so glad you guys were pleased Jamie! I hope ya'll had an amazing vacation and you're welcome back any time! 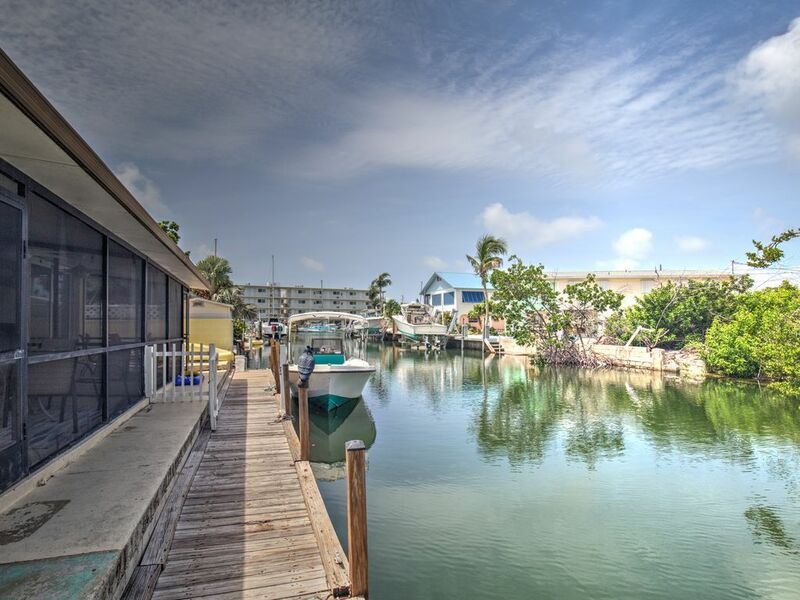 Neat, quiet, updated duplex on the water and close to everything in Marathon, FL. Hi Pat! I'm so glad you were pleased with the house and we could help you have a memorable vacation! What makes Marathon great is how centrally located it is. It's a wonderful location in the middle of the keys. An easy day trip south to Key West and also you can head an hour up north to check out Key Largo, or 20 minutes to Islamorada. The neighborhood is walkable for any essentials. It's a short walk to the movie theater, post office, grocery, and pharmacy. The house is located on a quiet cul-de-sac and dead end canal. There's no through traffic on the street, and you can fall asleep to the sound of palm trees blowing in the wind! There is no smoking on the grounds, at all. $300 security deposit will be retained if guests are found to be smoking. The dock can accommodate up to a 24' boat Full security deposit will be collected if there are pets present at this location. For security reasons I will not disclose the address until a booking is confirmed. We are responsible for providing a safe, comfortable space, clean linens, and kitchen utensils. Any personal preferences (spices, coffee, breakfast) is the responsibility of the guest. We do live on an island and wifi or power outages are not completely unheard of. If you get one of these just hold on for an hour or so, they don't usually last long. If it's longer than that let me know I can call Comcast and see what's going on. I cannot be held responsible for any outages for wifi, cable, water service, or anything else that is completely out of my control. We are licensed for 6 guests, but 4 fit comfortably in beds. I get quite a few questions about 2 people staying on an air mattress, and I'm totally fine with that. As long as the number of guests doesn't exceed 6, you can sleep however you want. There is a $20 charge a night per person after 4 (to make up for utilities usage). The landscaper or pest control men may come during your stay. Please be compliant with them, as they take care of the property to keep it nice for the rest of us. PLEASE let me know if there's some sort of problem that needs fixing/addressing. Since we live 3,000 miles away now there's no way for me to know if the house needs attention unless I'm told.